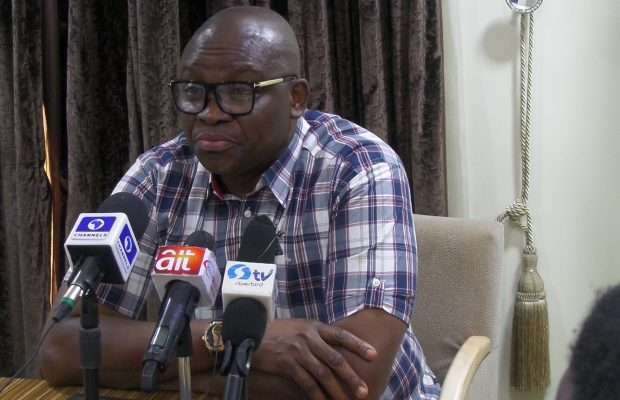 Governor Ayodele Fayose of Ekiti state has praised the leader of the Indigenous people of Biafra(IPOB), Nnamdi Kanu for meeting with Some south east governors a few days ago in Enugu state. He blamed President Muhammadu Buhari’s actions for agitations in the country. “The father figure of this country is president Buhari and, if his language does not represent unity, there will be agitations like we are seeing now. A father figure rallies even the bad boys in his house. The utterances and actions of Buhari, when he became president, were against the unity of this country. The statement read in part: “This meeting has provided a veritable platform, which the Igbo must key into otherwise they will remain guinea pig as long as this country exists. That Eze Israel Kanu, the father of the IPOB leader, Nnamdi, and elder-statesman, Prof. Ben Nwabueze, were part of the meeting is a sign of strong determination and unity on the part of the South-East leaders and their governors, which I believe will end up in the amicable resolution of all issues involved, especially by pro-Biafra activists and IPOB. While I appeal to the federal government to allow political solutions to agitations by Nigerians as against the use of brute force, which, regrettably, has become the hallmark of this administration, I remain committed to the call for a full and total restructuring of Nigeria through dialogue and negotiation. Even though it is too late for Nigeria to disintegrate, we do not need the All Progressives Congress kind of restructuring. Once again, I salute my brother governors from the South-East for their historic meeting of yesterday and I urge them not to relent in their efforts to bring lasting peace and harmony to their region.